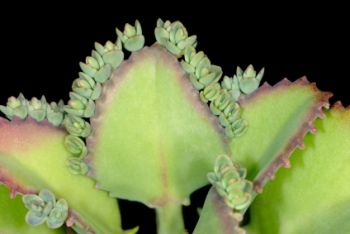 Mother of Thousands is a succulent that grows from a single stem, covered top to bottom with big, blue-green leaves. Its narrow, pointed leaves can grow to 6 in (15 cm) long and about half as wide. 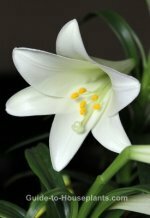 The real attraction are the tiny plantlets that grow along the edges of the leaves, which easily fall off and will root where they drop. You've probably guessed already -- that's how this succulent plant earned its common name. Although a good-looking plant, it can really be a nuisance by spreading itself around. Fortunately, that's not much of a concern when you grow Mother of Thousands indoors. However, you may find its plantlets sprouting in adjacent pots! When grown outdoors, it flowers in late winter then dies, with many offspring to take its place. The flowers are grayish-lavender, but you'll probably never see them because this succulent rarely flowers indoors. Belonging to the Crassulaceae family, they are among a diverse group. Flaming Katy -- admired for its clusters of tiny flowers, and Jade Plant -- a branched tree covered with plump, shiny leaves are just a couple of common house plants in this family tree. They're all leafy succulents and easy to care for, so this Kalanchoe is in good company. Light tip: Like most succulents, Kalanchoe daigremontiana grows best in bright light. It will even enjoy some direct morning sun. Move it outside for the summer, if you want. Just make the move a gradual one to avoid scorching its leaves. Be sure to bring it back indoors if the temperature drops below 40°F/4°C because it won't tolerate any frost. Mother of Thousands is easy to grow in average room conditions. One thing it doesn't like is soggy soil, so I'd recommend potting it in a terra cotta pot with drainage holes and using a sandy medium, such as cactus potting mix for fast drainage. Repot in spring only when it outgrows its pot. But don't over-pot. Use a container that's only slightly larger. All parts of this plant are poisonous. Keep it out of the reach of children or pets -- it may be fatal if ingested. You'll find these succulents for sale by many names: Mother of Thousands, Devil's Backbone, Alligator Plant and Mexican Hat Plant. Look for the botanical name Kalanchoe daigremontiana to be sure you're getting this plant. Light: Bright light to full sun. Water: Water thoroughly, then allow top 2 inches of soil to dry out between waterings. Cut back on watering in winter, but don't allow soil to dry out completely. Avoid getting the leaves wet to prevent rot. Water the potting mix or water from the bottom. Also, remember to always use room-temperature water when watering your plants. Temperature: Average room temperatures 60-75°F/16-24°C. It will tolerate extreme heat, but not frost. Fertilizer: Feed quarterly with a fertilizer specially made for succulents. Propagation: Easily propagated by the plantlets that fall off its leaves. Or, you can break them off and pot them in barely-moist cactus potting mix. The best time to propagate is in spring and summer.